LINCOLN – Calling all burrito lov- ers: Chipotle Mexican Grill opened its newest store at the Lincoln Mall on Tuesday. The fast casual-style eatery serves up Mission-style burritos, tacos and other Mexican-American cuisine. The new restaurant is part of a new building recently erected on the Lincoln Mall property between McDonald's and Santander Bank. Chipotle's general manager, Cameron Ossing, and apprentice Laura Graham were at the restaurant Monday pre- paring for opening day, while crews trained the store's future employees. During the course of Monday's training, the restaurant had to turn away nearly 300 people who noticed the activity happening inside. Graham said her hope for the res- taurant is to be a "staple of the com- munity." "I'm excited to welcome the people of Lincoln here," she said, and to pro- vide a place for people to come for a good meal, as well as opportunities for employment for number of local residents. With Black Friday coming, Graham said Chipotle looks forward to feeding a lot of people who visit the shopping plaza, including store employ- ees and hungry shoppers. Chipotle will be open daily from 10:45 a.m. to 10:05 p.m. "We stay open for an extra five min- utes to give the stragglers some time to get in … the people who are caught in traffic and arrive in the parking lot at 9:58," she said. In the same building as Chipotle, another restaurant is aiming to open by the end of the month. IHOP is current- ly building out its space and is planning to open before Thanksgiving, accord- ing to Lincoln Building Official Roger Pierce. First founded in 1958, IHOP is best known for its pancakes, but serves up a variety of other breakfast, lunch and dinner dishes. Prior to opening, Pierce will do a final inspection on the breakfast restaurant. He said the Rhode Island Department of Health will also need to complete an inspection of the space at 622 George Washington Highway. According to the restaurant's page, the restaurant is a "family owned and operated small Rhode Island busi- ness. Our mission is to create local jobs, serve great cooked-to-order food and provide service that goes beyond expectations to all our guests – while being an active part of the community." 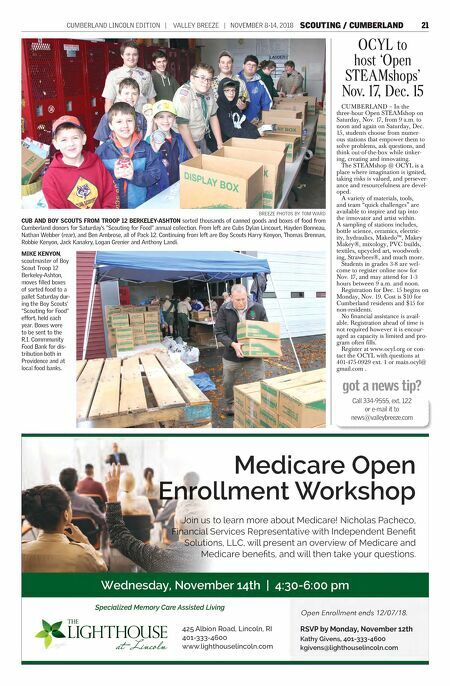 By NICOLE DOTZENROD Valley Breeze Staff Writer nicole@valleybreeze.com 20 LINCOLN NOVEMBER 8-14, 2018 | VALLEY BREEZE | CUMBERLAND LINCOLN EDITION Chipotle opens at Lincoln Mall BREEZE PHOTO BY NICOLE DOTZENROD Less than 24 hours before opening day of the Chipotle at Lincoln Mall, appren- tice LAURA GRAHAM and general man- ager CAMERON OSSING said they're excited to become part of the commu- nity in Lincoln. BREEZE PHOTOS BY TOM WARD On Tuesday, Swank Construction of New Kensington, Penn. employees were completing the road milling (surface removal) of asphalt on RAILROAD STREET, Manville. The renovation project, which included new curbing, lasted much of the summer. The final coat of asphalt is expected soon. 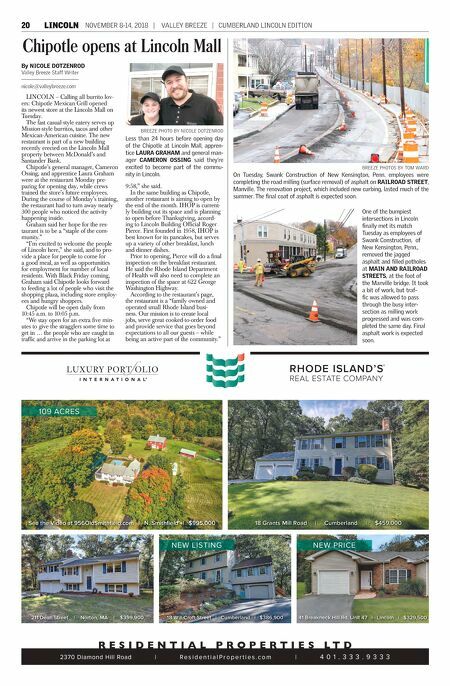 One of the bumpiest intersections in Lincoln finally met its match Tuesday as employees of Swank Construction, of New Kensington, Penn., removed the jagged asphalt and filled potholes at MAIN AND RAILROAD STREETS, at the foot of the Manville bridge. It took a bit of work, but traf- fic was allowed to pass through the busy inter- section as milling work progressed and was com- pleted the same day. Final asphalt work is expected soon.